Aesthetic Design & Build is a provider under deck ceilings to St. Louis and St. Charles County. 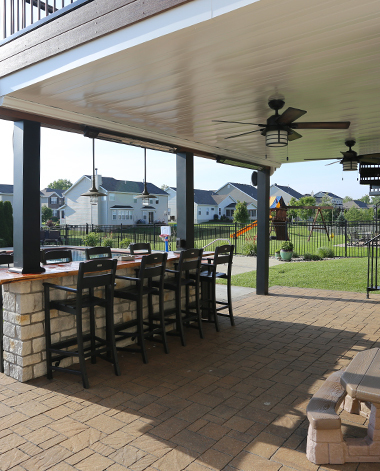 The under deck ceiling is a cost effective way to expand your living space to the outdoors and to provide shade and rain protection for outdoor bars and lounge areas. The under deck ceiling is an innovative solution that allows for increased flexibility in your outdoor space. The ceilings can create an outdoor living area that incorporates televisions, bars and lighting without concern for rain, sun or other St. Louis weather inconsistencies year round, further protecting your outdoor living investment. Aesthetic Design & Build uses an innovative method of designing and installing our under deck ceilings that eliminates any hassle with cleaning and maintenance of the area due to the collection of dust, leaves and other outdoor debris. Our under deck ceilings have removable panels that allow the area to be cleaned out with little maintenance involved, leaving homeowners with a beautiful addition to their home that is hassle free for many years. If you are interested in the addition of an under deck ceiling to your St. Louis home, contact us or call 636-532-5008 today!